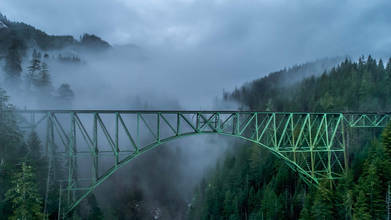 Description: The Vance Creek Bridge was built in 1929 for a logging railroad. It is the second highest railroad arch in the United States at 347ft. It sits amongst the Satsop Hills. Abandoned in the 1970’s, the bridge is now an attraction for hikers, photographers and urban explorers. Due to arson and graffiti, parts of the bridge are being removed to limit access. It was added to the National Register of Historic Places in 1982. NOTE: As with all sites, please respect the land, structures and wildlife. Do not trespass, do not climb over fences, do not enter unless allowed to do so, do not litter, do not touch, and enjoy the views.